The explosive midfielder drove his team through the finals with a series of excellent performances and won his second consecutive Jack Dyer Medal. Can turn a game off his own boot with his explosive bursts from stoppages and has the ability to push forward and win one-on-one contests. A nightmare for opponents, he is the hardest player in the AFL to tackle with his trademark ‘don’t argue’. 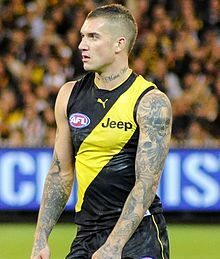 Dustin is now regarded as one of the most marketable athletes in the AFL, if not the country. His stories and humorous take on life make him a ‘must book’ for your next event. Martin is notable for his core strength and famous ‘don’t argue’, a fend-off technique that makes him notoriously difficult to tackle which make him an inspiration to a generation.